Very easy to make but rather sticky!! Melt together 200g of the chocolate with the cream then stir in the mincemeat till the suet has melted. Line a baking tin with cling film and pour in the chocolate mixture then chill for an hour. Grate the remaining chocolate. 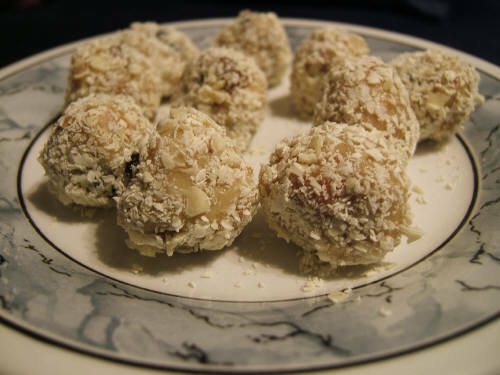 Divide the chilled mixture into 30 pieces, shape into balls and roll in the grated chocolate. Chill for 1 hour until firm. This is my new favourite way to make mince pies. You can top each pie with pastry if you prefer, though of course you will need more pastry in that case. When topping with pastry I usually cut out star shapes with a cookie cutter and pop a star on each pie rather than cutting circles to completely cover the mincemeat, but again, go with your own preference. Or give this recipe a try instead! Roll out the pastry to about 3mm thick and cut rounds with a cookie cutter or large glass. Use to line the holes in a cupcake tin. Spoon one teaspoonful of mincemeat into each pastry case then set the tray aside. Make the sponge topping: cream together the sugar and butter then beat in the eggs. Add the milk and vanilla, then sift in the flour and mix well. 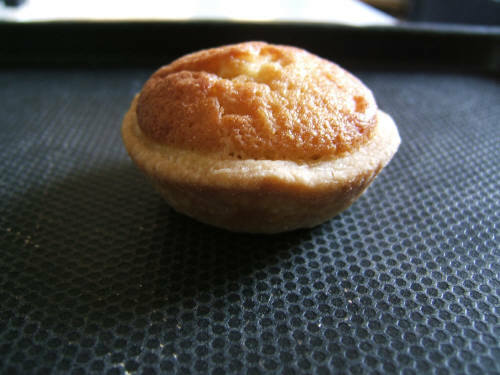 Spoon one teaspoonful of sponge mixture onto each pie, smoothing over to cover the mincemeat. Bake for about 20 minutes, till the sponge is golden and well-risen. Cool in the tin for 5 minutes then transfer to a wire rack till cold. Delicious eaten warm or cold, with cream, brandy butter or custard or just as they are! They freeze well too. I have to be careful with mincemeat because of my nut allergy, so I make my own to be certain it's safe to eat. I think this version tastes nicer, anyway - it's not quite so rich and sickly sweet as the shop-bought varieties! Makes: Lots - about 9lb! You might want to try using just a third of each ingredient unless you're catering for a large number of people! Peel, core and grate the apple - a food processor with grater blade is best for this step. Peel and grate the carrots, again using a food processor if you have one. Put all the ingredients except the brandy (or apple juice) into a LARGE bowl, mix well, cover, and leave for 24 hours. Add the brandy, mix again, and pack into sterilised jars. Make lots of mince pies! Also good in mincemeat cake, mincemeat crumble slices or mincemeat truffles - look out for those recipes soon. These measurements are quite vague, but that's just to give you flexibility.... For info, I used about 250g of each variety of chocolate and made about 30 of these treats each time. These look great, taste great, and are easy to make. Ideal for a handmade gift. 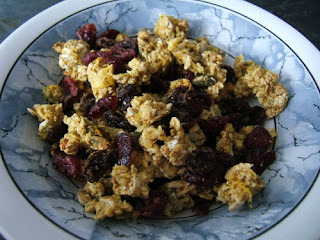 Toppings - raisins, chopped cranberries, chopped crystallised ginger, chopped nuts, tiny sweets - use your imagination! Melt the chocolate, either in a bowl over simmering water or in short bursts in the microwave. 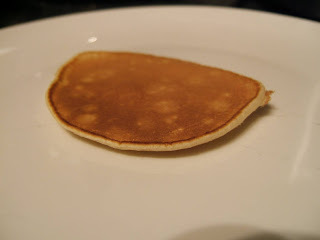 Drop teaspoonfuls onto non-stick baking parchment. Sprinkle over your chosen topping and leave to set. It's that easy :-) Store in an airtight container in a cool place - will keep for several weeks so can be made in advance for Christmas presents. 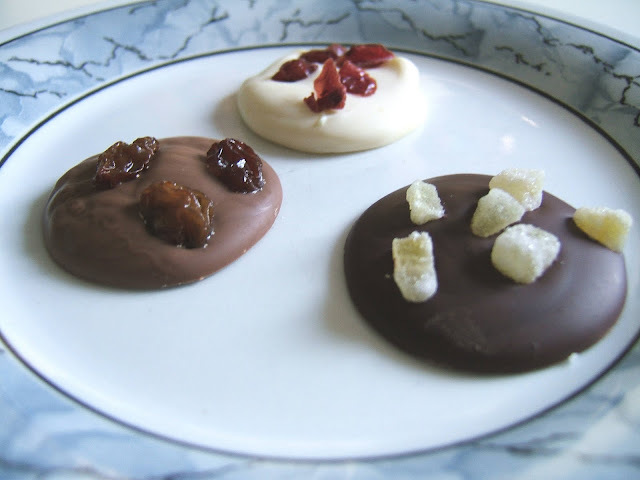 Recommended combinations: plain chocolate and ginger, milk chocolate and raisins, white chocolate and cranberries. No boiling required - this is such a quick and easy fudge to make, but it's very sweet - a little goes a long way! Break the chocolate into pieces and melt it with the butter over a pan of simmering water or in the microwave. Remove from the heat and stir in the milk and vanilla. Press into a greased 7" square tin, levelling the surface. Refrigerate overnight then cut into 36 squares. Keep refrigerated. 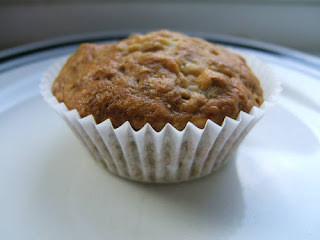 Great way to use up bananas that have gone a bit brown and soft :-) And it's a low-fat recipe, containing fruit, so it's cake that's good for you! Bonus! Preheat the oven to 170oC (fan oven)/190oC/Gas Mark 5. Peel the bananas and place into a separate bowl. Mash them to a puree then add the egg, beaten. Beat the sugar and water into the banana mixture then add the oil and stir well. Tip in the dry ingredients and quickly mix till just combined. 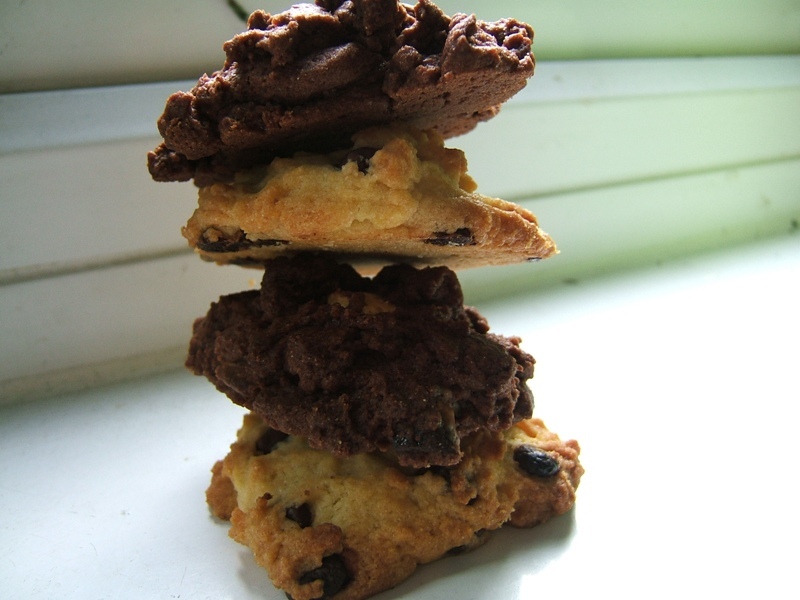 Don't overmix - it's better to have a few lumps and traces of flour! Spoon into paper cases and bake for 20-25 minutes, until firm and springy to the touch. Cool on a wire rack. Best eaten fresh but they also freeze well - great for lunchboxes! It sounds really decadent but it isn't really too bad as a treat now and then - and you can buy packs of smoked salmon scraps quite cheaply which makes this dish even more affordable. It works fine without the spinach if you prefer. Cook and drain the pasta and return to the pan. Stir in the creme fraiche then cut the salmon into small pieces and add. Rinse the spinach and drain. Add to the pasta mixture and stir well. Heat through gently until the spinach wilts (5 minutes should be plenty). Season with a squeeze of lemon juice - about 1 tsp - and plenty of black pepper. I make this mainly for pasta, with or without various extras (see below), but it's also great as a pizza topping. The long cooking time and the addition of butter at the end makes the tomatoes sweet without any harshness or bitterness. While it's not a quick recipe, it is extremely easy and preparation is very quick - it's just that it needs to cook for a while! Heat the oil and add the garlic, then cook until the garlic is softened but not browned. Add the tomatoes and break them up with a wooden spoon. Bring to the boil then turn right down to simmering point, cover, and cook gently for about an hour, stirring occasionally. The sauce should be quite thick, without any 'liquid' layer at the top. Take the pan off the heat and add the butter. Stir until the butter melts. Add the basil, torn into pieces, if desired. Other herbs, dried or fresh, could be added - basil should only go in at the end but other herbs could be added with the tomatoes. Other variations might be: Add finely chopped onion with the garlic and cook until translucent before adding the tomatoes; fry sliced some mushrooms with the garlic till golden; add small pieces of bacon, fried until crispy (I like this better if you cook the bacon separately and add it after cooking the sauce); any of your own ideas! Measure the flour and sugar into a bowl and mix together then add the egg. Mix to a smooth paste. Gradually mix in the milk until the consistency is like double cream (you may need slightly more or less milk, depending on the size of the egg). Pre-heat a non-stick frying pan (you may need a little oil in the pan, though I don't use any). Add spoonfuls of batter to the pan and cook until the bottom is brown and the top has dried out. Flip to brown the other side then serve warm. Preheat the oven to 160oC (fan oven)/180oC/Gas Mark 4 and line a baking tray with non-stick baking parchment. Finely grate the rind of the oranges and squeeze out the juice. Put the rind and juice together with the honey in a saucepan and warm gently. Bake for 40-45 minutes, stirring occasionally to break up the clumps, till golden and starting to crisp. Give it a bit longer if you like your granola really crunchy. Stir in the fruit then leave to cool before storing in an airtight container. It keeps well for at least a week. If you're not sure you'll get through it in that time, halve the recipe (in fact, all the quantities here are doubled from the original as I found it better to make it in bulk!) It may not need to bake for quite as long though so keep an eye on it. Preheat the oven to 130oC (fan oven)/150oC/Gas Mark 2. Cream together the butter/marg and sugar then add the eggs and stir well. 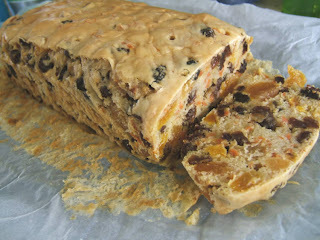 Sift in the flour and baking powder and stir to combine then fold in the carrot, apricots, raisins and sultanas. Pour into a greased and lined 1 lb (450g) loaf tin. Bake for about an hour and 10 minutes, till a skewer poked into the middle comes out clean. Cool in the tin for 10 minutes then transfer to a wire rack and allow to cool completely before slicing. Oh boy, this is good :-) It's what I usually make as an end-of-term treat for my kids' teachers (who also happen to be my colleagues, no harm in getting them on side...!) You really do need cheapo cooking chocolate, don't try it with good-quality chocolate, it's actually better with the cheap stuff! And no baking required (though there is some melting). Melt together the butter/marg, cooking chocolate and syrup - either in a bowl over simmering water, or in short bursts in the microwave. Press into a greased and lined oblong baking tin and refrigerate till set. 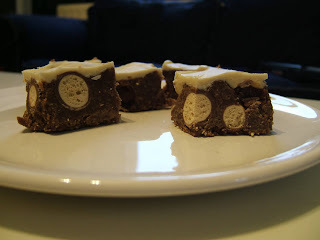 Melt the white chocolate (again, over hot water or in the microwave - your choice!) and spread over the biscuit mixture. Refrigerate again till the chocolate has set.